Jesus said, I came not like a thief to steal and destroy, but to give life and to give it abundantly (John 10:10). In the first series the focus is on life. Jesus is the Truth and the Life. We can have life only when its based on the Truth. How Jesus Christ can be the Only Truth and the Only way is clearly explained in this series as we explore the Bible from Genesis to Revelation to understand who God is, His character, His integrity, His personhood, and His love for mankind. We also learn why God wanted to save mankind and why there can only be one way of salvation, through Jesus Christ. Foundation for Life explains the only sure foundation for everyone's life, trust in the Lord Jesus Christ. Foundation for Living begins where the first series, Foundation for Life, ends. Once a person trusts Christ as savior a new life instantly begins. This new spiritual life must be nourished to grow to maturity. God in His grace also designed a perfect plan for spiritual growth through His indwelling and filling Holy Spirit. In this series we will learn how to truly live, to enjoy in our day to day life the rich blessing God provides each Christian from the instant of salvation. This series will also include practical guidelines for Bible study, prayer, witnessing, and understanding your important role within the body of Christ and your local church. 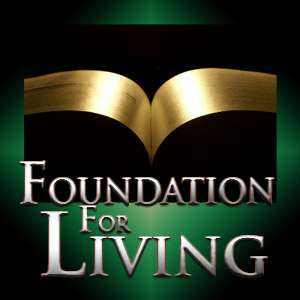 To view all video Bible studies in the Foundation for Living series, click here. 1 - What if I Sin?